It's not her best, but nobody did what Jackson did best any better. Shirley Jackson is best remembered for her short story The Lottery, and it's a puzzle to me why that story never made more people seek out more of her other work. Shirley Jackson should've been a rock star, and not just of genre fiction like The Haunting of Hill House, which spawned arguably the greatest black-and-white horror movie ever made. Sure, many genre aficionados like Stephen King, notably, consider her a legend, and her novel We Have Always Lived in the Castle is one of the great books you're likely to read. All that is to say that I am a happy man when I find a stray copy of a Shirley Jackson book at my local used book store, and I approach them expecting quite a lot. 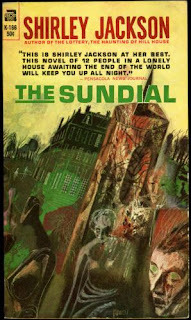 On the one hand, The Sundial isn't her best book. But on the other hand, it has a lot of what she does better than anybody in it, and it presages her greatest works, which were yet to come. The Sundial tells the story of the Halloran House and its inhabitants, none of whom are what you'd call "likable characters." Out of the huge cast of characters, especially for such a slim book, the most prominent is Orianna Halloran, whom we meet when the book opens, just after the funeral of her only son, Lionel. Other members of the family, notably Lionel's widow and young daughter, openly accuse Orianna of killing Lionel by shoving him down the stairs, so that she could inherit the house. Orianna is a piece of work — she's cunning, ruthless, shrewd, and really just smarter than anybody else in the house. It's this characterization that makes her at least a fascinating character to read, if not root for, and her biting, clear-eyed manipulation of everyone else in the house is where Jackson's perceptive writing just absolutely shines. The extended Halloran family and staff who populate the home are put on their heels when Aunt Fanny, Orianna's sister-in-law and daughter of the late Mr. Halloran, who built the sprawling house, sees a vision of her departed father in the garden, by the sundial, and he informs Fanny that the world will shortly be consumed by flame, and all will perish, with the exception of those living in the house. Those, he can protect. Little-by-little, the house acquires a small handful of new residents (including a stranger Aunt Fanny picks up on a street corner in town and dubs "The Captain," for reasons known only to her), and what seems like the confused hallucination of beleaguered Aunt Fanny gains more credence with subsequent visions, and all who live in the home begin making preparations for the coming apocalypse. I cannot stress enough how awful these people are. There is a long sequence late in the novel where they invite the townspeople up to the house and grounds for a barbeque, to give the little peons one last moment of happiness before the end of days — of which said peons are totally unaware. Because what joy in life could working people possibly have unless it is gifted them by the fabulously well-to-do Hallorans from the sprawling estate on the top of the hill? But Jackson's gift for capturing human behavior, and pettiness, sometimes, with such finely observed detail really shines in segments like this. It's a joy to observe Aunt Fanny's foolish entitlement juxtaposed with scenes of the villagers interacting with her, in which we realize she is so transparent in her cluelessness that everybody is in on the joke except her. The book's themes of wealth, entitlement, and gender roles still resonate today, and I think in large part that's less a statement about the stagnation of progress or anything like that, but more a tribute to Jackson's ability to grab onto the fundamentally human, and show us sad realities of how we interact with each other on a day-to-day basis. On the whole, there are too many characters for such a short book, so we see some characters in razor focus, while others recede into a sort of literary soup, where it becomes difficult to remember which tertiary spoiled young woman is which. And even though the book is intended to leave some questions about the future, I felt it ended perhaps a page too early. After a shocking twist at the end that literally dropped my jaw (but was totally earned and set up deftly from the first page), I felt I'd been left dangling a little. So Shirley Jackson's best book about a sprawling house with its own personality is undoubtedly The Haunting of Hill House, and her best book about a wealthy, reclusive family is undoubtedly We Have Always Lived in the Castle, but The Sundial is still a fine example of the kind of writing that made Shirley Jackson such a force. Posted by Vance K — Emmy-winning producer, cult film reviewer, and co-editor of nerds of a feather, flock together since 2012.